When I was a small kid, back in our ancestral home in Sooramangalam Village in Pondicherry, we had a LP record player. Not a gramophone but a modern (then!) player. My Dad and Uncle owned Record album holders (which looked like monstrous sized photo albums) with records of English, Tamil and Hindi songs. As we grew up and moved houses, no one knows where the record player and the LPs are. My suspicion is that they are all discarded and must be lying in garbage dumps somewhere. When I started my antiques collection, the LP records were firmly on the ‘Must have’ list. Five years ago, when I visited Moore Market to buy books, I noticed a few shops selling these records. When I made a visit there again, I was hoping that those shops still existed. I was not to be disappointed. I went there on a week day at 11 am (that’s the time most shops open) and spent an entire day there rummaging through the collection. The shop you see below is just one of the shops that the owner has. He has a few more mostly used as godowns stocked with records, piled up from floor to ceiling. I was spoiled for choice. Most of the records I picked up were old English music ones. 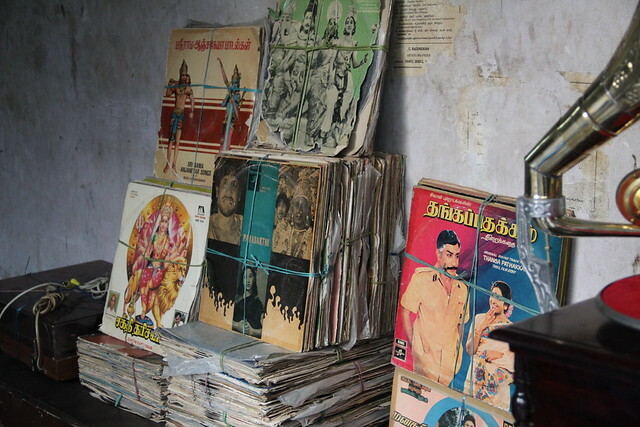 I also picked up a lot of old tamil songs featuring Sivaji Ganesan. The MGR songs LPs were sold at a premium. 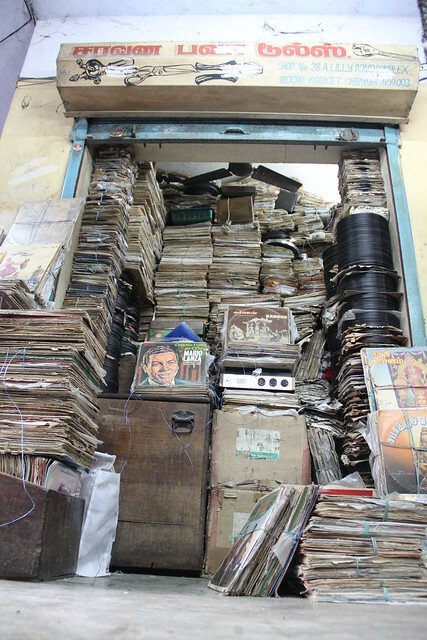 The owner tells me its mostly the aged AIADMK party workers who come and pick up the MGR records. 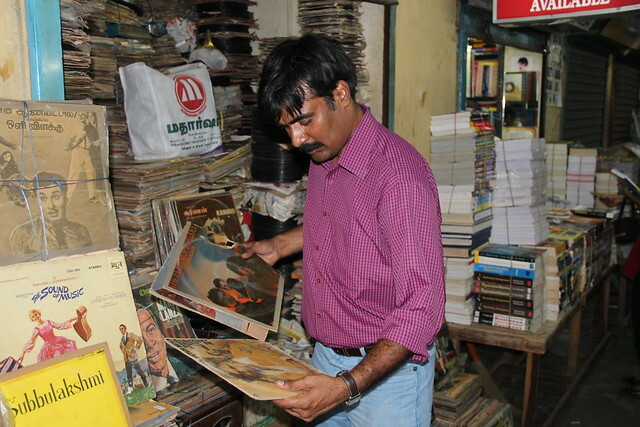 My favorites were Rajini and Kamal records. 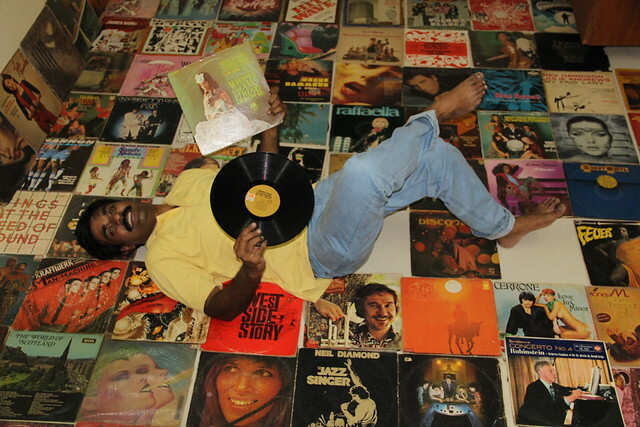 That’s me with my collection of records at my home. It’s a sizeable collection. Now, the onus lies in me to take care of them. While I own a gramophone, these big records cannot be played on them. I need to purchase a more modern record player. That’s next on my list. More photos from the Vinyl Records hunt. The complete list of all the vinyl records that I own. Each individually photographed. Kiruba Shankar is CEO of Breathe Digital, a digital marketing consultancy. He is an author of 5 books, Professor of Digital Marketing and a Weekend Organic Farmer. More about him at http://Kiruba.com. Kiruba is a Professional Speaker and is the Founding President of the Professional Speakers Association of India. His Professional Speaking site is at http://Kiruba.Pro. He can be reached at +91.9841597744 or Kiruba @ Kiruba.com.